Home » Memorabilia » Email us! 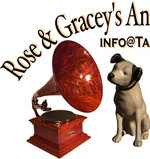 All of our Phonograph Memorabilia is original and is in "as found" condition. The Talking Book Corporation produced a series of talking records in the late teens and early 20s. 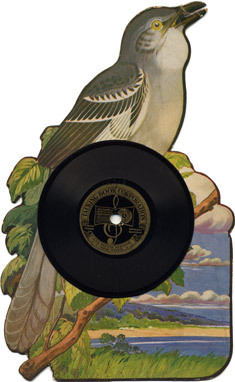 This particular talking record is the Mocking Bird and was produced in 1918. Suitable for framing or playing, the mocking bird measures approx. 10" x 6". There is some damage to the beak which was taped long before we found it. The Talking Book Corporation produced a series of talking records in the late teens and early 20s. 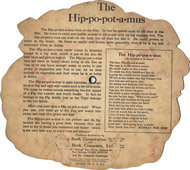 This particular talking record is the Hippopotamus and was produced in 1919. 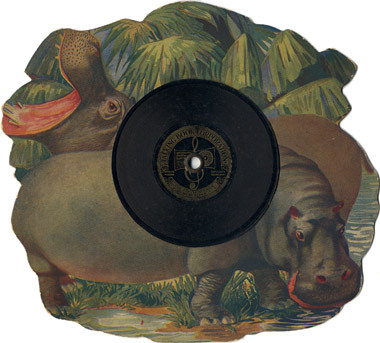 Suitable for framing or playing, the hippopotamus measures approx. 10" x 6". 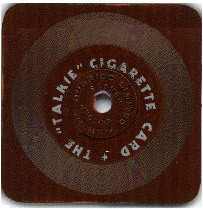 The "Talkie" Cigarette Card an unusual paper record from the early 1930s. It measures 2.75 inches sq. and was issued by the Record Cigarette Company, London, England and produced by the Dubrico Limited Co. of Slough, England. This unique record is No. 5 from a series of 25 recordings produced as part of tobacco trading card series which was quite popular during the 1930s. (Tobacco trading cards were similar to baseball cards in which they would have a picture of something on the front and a description on the back.) This record has not been played and is in mint condition. No. 5 "The Children's Hour" is narrated by Mr. C. L. T. Farrar, better known as "Uncle Ajax". 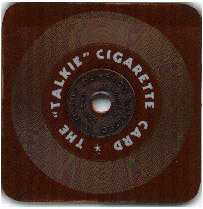 The "Talkie" Cigarette Card an unusual paper record from the early 1930s. It measures 2.75 inches sq. and was issued by the Record Cigarette Company, London, England and produced by the Dubrico Limited Co. of Slough, England. This unique record is No. 7 from a series of 25 recordings produced as part of tobacco trading card series which was quite popular during the 1930s. (Tobacco trading cards were similar to baseball cards in which they would have a picture of something on the front and a description on the back.) This record has not been played and is in mint condition. No. 7 "The Stage" is narrated by Nelson Keys, one of the most popular stage and silent film stars. A great Champion Needle Tube/Container from the mid-teens through the 1920s. Produced by Champion Products Co. New York and contained 40 Champion Fine Tone Phonograph Needles for 10¢. Measures 2.5" Long. Looking for Needle Tins? Click here. And Victor Tins? Click here.